1. Help students gain organizational skills and academic ownership. Students meet at the beginning and the end of their school day in their homeroom where teachers support students in utilizing the school wide homework agenda. During class, teachers allot time for students time to write down the homework, and homeroom teachers cross check that the assignments are written and any materials needed to complete the assignment are packed to go home. 2. Not overwhelm students with too much homework on any given night, but continue to challenge them to work independently outside of the classroom. 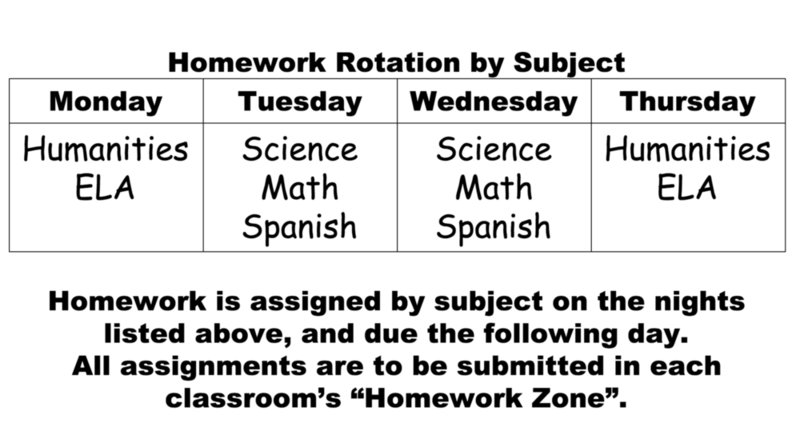 Each subject has specific days that homework is assigned each week, all year long. For example, ELA and Humanities assign homework on Mondays and Thursdays, and Science, Math, and Spanish assign homework on Tuesdays and Wednesdays. This routine helps students to anticipate what their workload might be, and helps parents to know exactly what homework their child should have each night. homework, and homeroom teachers cross check that the assignments are written and any materials needed to complete the assignment are packed to go home.